Learn more about her national costume here! The Miss Universe 2017 hopefuls showcased their national costumes last weekend in Las Vegas, and our Bb. Pilipinas-Universe Rachel Peters was more than ready to represent Filipino pride. 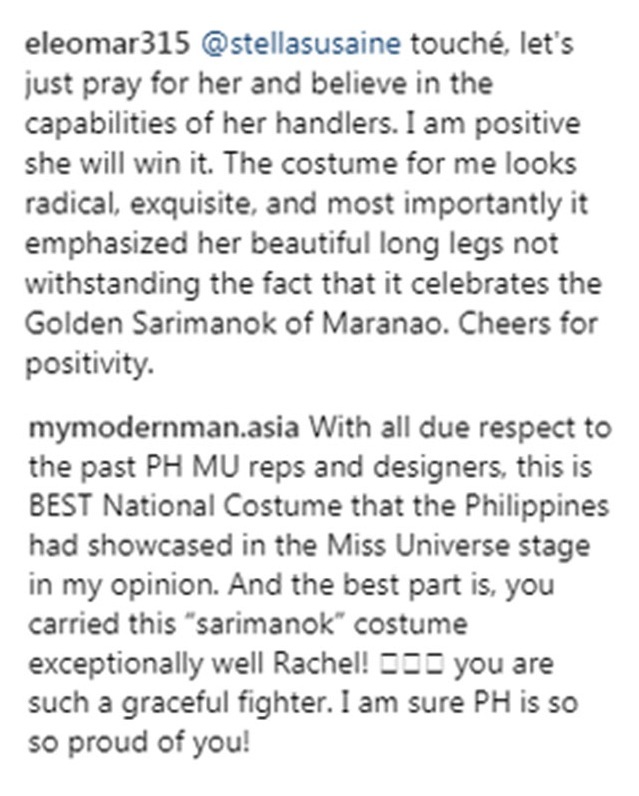 Rachel dazzled onlookers with an all-gold ensemble, inspired by none other than the Maranao legendary bird, the sarimanok. Designer Val Taguba was tasked with giving the mythical creature a modern twist for our Miss Universe-Philippines’ national costume. He designed a sequined body suit with an embellished train attached to her hip. Rachel wore a sculpted headdress, also in gold, bearing the sarimanok's head and feathers. Her look was completed by a pair of gladiator thigh-highs by shoe designer Jojo Bragais. On Instagram, Rachel was showered with compliments for her daring take on a national costume. Her long and statuesque legs were the center of attention, too, as they have quickly become one of her standout features. About the sarimanok, legend says that it was a messenger to the gods. One story traces its origins to a party thrown by a sultan of Lanao for his daughter Princess Sari. The celebration was told to have been interrupted by a majestic bird that took the princess, never to be seen by her father again. The sullen sultan then had the image of the rooster replicated in memory of his lost daughter. Moreover, the legendary rooster is also a symbol of wealth and prosperity for the Maranao. It is known to have bright and colorful feathers, usually portrayed with a fish hanging from its beak. Given its significance to Mindanaoan culture, this was not the first time a Filipina beauty queen donned the sarimanok for her national costume. Ruffa Gutierrez wore a Ben Farrales piece inspired by it during her run as Miss World-Philippines in 1993. All that said, Rachel is without a doubt putting up a good fight for the crown. We can't wait for the live show on the 25th!